The Alhambra in Granada, Spain was the only attraction that we booked ahead of time, and I’m so glad that we did. The ticket-buying process was fairly painless, and we were assured entrance into one of the greatest sites in Spain. We decided that both a night visit and day visit would be worth it for us. Reading the online reviews, it was almost unanimous advice that the day visit was not to be missed, but that a night visit is worth an additional trip if you have the time and don’t mind spending the money. Well, I’m going to argue that I enjoyed the night visit more. The biggest downside was that our time was limited at night (we only had one hour inside). 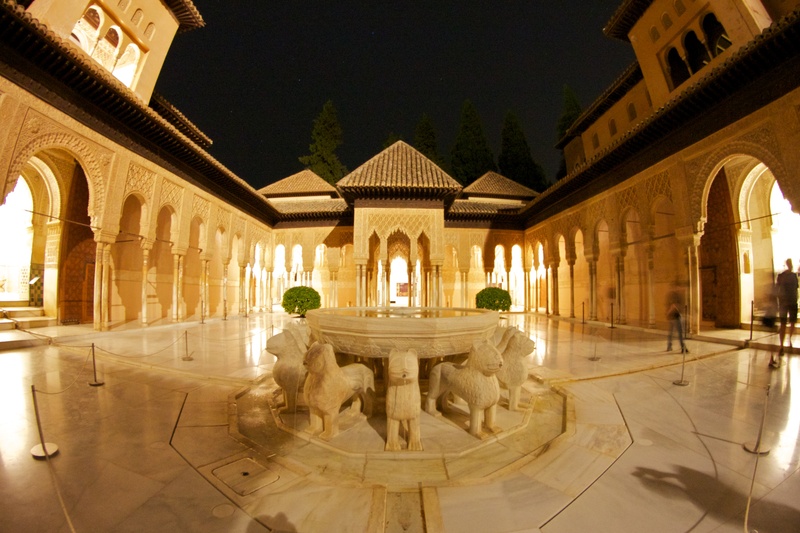 Our first night in Alhambra was the night we chose for the visit to the Palacios Nazaries at the Alhambra. For 9.30 euros each, we purchased tickets to the 22:30 entrance. The palace at night was magical and much less crowded than it was during the day. There are no audio guides available for the night visits, so it’s important to either visit at night after a day visit, or bring along a different type of guide – in our case, this was Rick Steves’ Spain (we talk about his books a lot – he has some great tours). 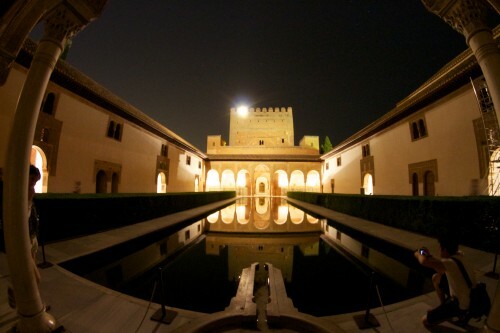 We learned about the history of the Alhambra and stories about each room and Courtyard, while examining the palace under the moonlight. The Courtyard of the Myrtles (pictured above) and the Courtyard of the Lions (pictured below) were my two favorite spots in the palace. Both were interior courtyards, but open to the sky. They exuded elegance, luxury, and privacy and I could imagine how perfect they would be for relaxation. The spacious Courtyard of the Lions with the prominent fountain in the middle. The palace was well-lit, so we were able to enjoy the Moorish details on the walls, ceilings, and archways. There were no tour groups to clog up the walkways and just a lot less traffic in each area of the palace. We left the palace only when we were kicked out and couldn’t wait to go back for more! We ate a huge, very late lunch, but otherwise, a night visit to the Alhambra can be finished off with a late dinner in Granada. We enjoyed two different areas of Granada for dinner – the sit-down restaurants on Paseos de los Tristes and the tapas bars on Calle Navas, which is just off of Plaza del Carmen. Both offer late-night dining that would be perfect after a nighttime visit to the Alhambra! This entry was posted in Things To Do, Travel and tagged Alhambra, Granada, Portugal/Spain 2012 Trip, Spain by Kristin. Bookmark the permalink. Hi! I’ve been reading up on your trip to Andalusia and your tips have been a great help! I had one question regarding your night visit to the Al Hambra. Were you allowed to bring a tripod? Thanks! We love that you’ve found our blog useful! I had a co-worker who just got back from Andalusia and it totally makes me want to go back! Unfortunately, they do not allow tripods in the Al Hambra during the day or night. I did actually try to disguise a mini tripod (one of those Gorilla-pod things) in my wife’s purse, but we actually did get scolded for trying to use it. Unfortunately, this means you just need to practice having a very steady hand or live with the noise from using a high ISO setting. The nice thing about the night tours is you can find a lot more time alone, however, so you are able to get some shots without the crowd. Good luck and have fun!